Group discount starting from 4 people for all stays of 3 days or more! Accessible holidays for disabled people near Montreal. A unique stay in Canada! 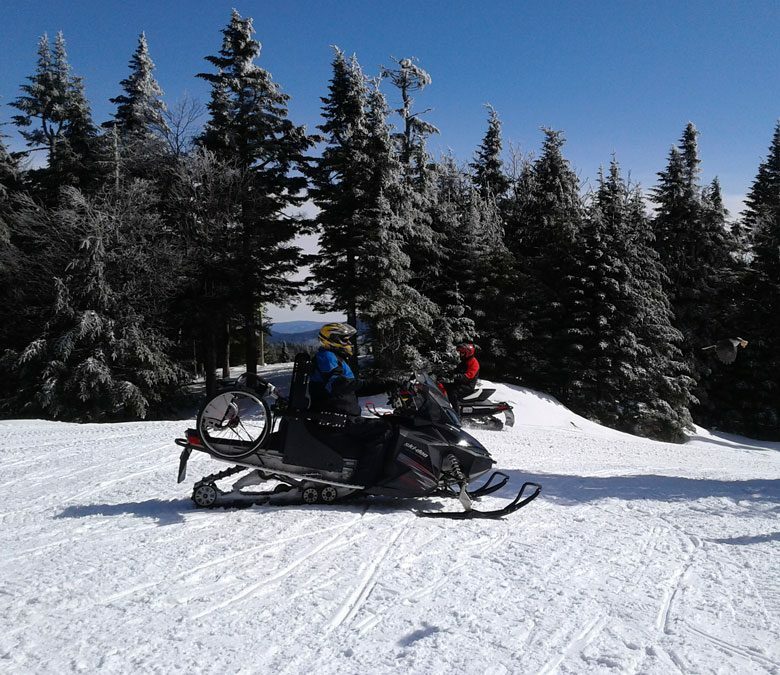 Because our motto is that snowmobiling must be accessible to all, we have adapted our snowmobiles for people with disabilities (motor disability, paraplegia, amputation of a lower or upper limb, eye disorders). We will study all requests! Our goal: to reach people like you with disabilities, in Quebec and around the world, and tell you that your dream is possible to achieve! The result: Accessible holidays near Montreal for people with disabilities. Now you can enjoy your vacation and live a unique adventure while driving your own snowmobile. A guide will accompany you with his own snowmobile. These holidays are accessible to all who are in good physical condition despite their handicap. Same costs policy for all. Regarding rates, we wanted to make this trip accessible to all so enjoy the occasion, as our rates do not increase even with customized situations. Our price remains exactly the same, even if we are the only ones to offer this unique opportunity. You can verify! In 2013, we were rewarded for our commitment, first by our region, which awarded us the 1st regional tourism award in the ecotourism and adventure tourism category; then, we were awarded with the national bronze award for the same year. In the beautiful Laurentides region, You will cross the Golden Gate Bridge and the steep routes through the Black Mountain but you will also feel the adventure’s thrill when crossing the Rouge-Matawin reserve and Mont-Tremblant park: more than 100 km through the heart of the forest: not one single village on the ride! For those who wish to do so, your journey will finish with a snowmobile trip at night. The crossing of Toro Lake, Masson and the Islands Lake enables you to test at a distance the top speed of your snowmobile. Alternatively, you can become the “musher” of your own dog team during the raid on the sixth day. Your stay will end with a guided and shopping tour of Saint-Sauveur and Montreal. Airport reception. Transfer by car to your cottages in Chertsey where a good meal awaits you. Two of these chalets are specially designed for people with reduced mobility. Settle in comfortably and enjoy this moment of tranquility in front of the fireplace. Dinner and night. After a “small” breakfast, we head for Sainte Marguerite du Lac Masson where we will distribute your snowmobile equipment. After training and safety instructions, you are ready to go on the tracks. Then we will have lunch at a restaurant. Your day ends with a first outing on open tracks. Night at the cottage. Your guide knows the region and will have you discover many short off-tracks! Note many wild animals tracks on the snow. Meal break in Saint-Côme where we stop to admire the ice sculptures. Night at the Chalet. Today, you will discover the Black Mountain with an unexpected welcoming! The breaks are frequent and the camera will also be gladly put to use. Open your eyes, you might be lucky enough to see a deer, a fox or a grouse. Diner and night at the Chalet. Free day ! You choose your program : Ice fishing, snow tubing, visiting the charming village of Saint Sauveur, or even, dog sledding. Dinner and night at the Chalet. Guided tour of Montreal and free afternoon in the “Old Montreal” for shopping. In the afternoon we will head with you to the airport for your flight home. You arrive in Europe in the morning. The price may vary depending on the rental period of the cottage. Departures are Saturday, other day please contact us for further information. Snowmobile insurance deductible : $2000 or $2500 per machine, according to the model. We will ask for a security deposit of the same amount via Visa or MasterCard credit card (Please verify your line of credit with your bank before so). The booking will be effective and confirmed upon receipt of a deposit of 550$ CAD per person. To rent and drive a snowmobile you need to be 21 years old or more and possess a valid driver license. I'm afraid of being cold to my paralyzed limbs. I have a special disability. Do you have a solution? Everyone is unique, that’s why we customize our stays and our machines for you, we will adapt to your needs. Yes, your accommodation has been specifically designed for your needs, snowmobiles and sleighs are suitable, as well as all restaurants we go to! I'm afraid the days are too tiring! We only leave small groups at a time and adapt the trips to everyone, it is you who decide the number of km you want to do.